A few days ago we had an interesting session with the Malaysian regulators. The agenda listed as “Discussion on the Wadiah Concept Paper”, a paper which was issued in December 2013, and had caused quite a stir in the industry. The main content of that paper was the treatment of Hibah (gift) payments on balances maintained in the Wadiah accounts, and the underlying rules of Wadiah. For clarity, Wadiah (safe keeping) contract is used in Malaysia for savings / transactional type of accounts. The intention is that the customer enters into a relationship with the bank as a Wadi’ (custodian of deposit) and Mudi’ (owner of capital / depositor). The mandate is purely on a custodial basis. In practice, the customer places funds with the bank for the purpose of safe keeping, therefore the bank must become just a custodian of the depositors money. However, it is unlikely that the bank just receives the funds and not utilise it for an economic activity. Because of this use of funds by the bank, Malaysian scholars view it is only fair as a good banking practice, that some discretionary returns may be given to customer for the use of the customer’s funds. This returns, while not promised up-front, has over a period of time, become customary (Urf’) in its execution and distribution. The whole arrangement is known as Wadiah Yad Dhamanah (safe custody with guarantee). As I understand it, only Malaysia offers this contract for Savings and/or Current Account products in the world. In all other geographies, the Current Account and/or Savings Account commonly use either the Qard (interest-free loan) contract, or the Mudharaba (profit sharing entrepreneurship) contract. All these years, we are of the view that there is a identifiable difference between Wadiah and Qard. Under Qard, the arrangement is where the customer provides the bank with a loan i.e. the deposit amount which must be returned to the customer upon demand. While Wadiah also operates the same way, the only difference is that Wadiah allows for the granting of discretionary Hibah arising from the use of the customer’s funds. 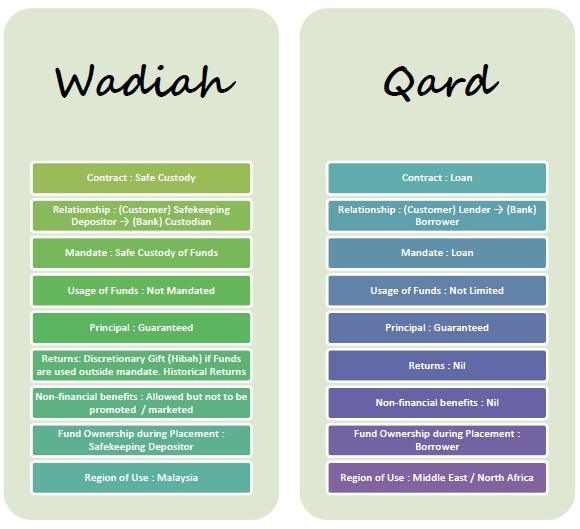 So it was a small surprise to note that in the Wadiah Concept paper issued in December last year, there is a specific mention that while there is a differentiation in relationship for Wadiah and Qard, the rules of Qard will also apply to Wadiah. The issue of discretionary Hibah is also raised that if the Hibah is paid consistently, it becomes customary (Urf’) and therefore can no longer be viewed as “discretionary”. Such allowance to continue to provide Hibah on a Wadiah (in name only) will only be temporary and will eventually turn to what is practiced in the middle east i.e. no payment of Hibah. Confusion may ensue as there will be two separate rules governing a Qard i.e. different rules in Malaysia and what is being practised elsewhere. This opens up the Malaysian-version of Qard to criticism and I believe, sooner than later, consolidation of practice and understanding will happen. The investment effort to be spent into Wadiah products will now no longer make sense. Eventually, Wadiah will cease to be a savings-and-deposit-building proposition for the Bank. It will revert into a basic, transactional and low balance proposition, which might not be attractive for Banks to further invest into. Other options will now take prominence. Will Wadiah also survive this re-branding of Islamic Banking in general in Malaysia? We are expecting some changes to surface this end of year and it will put further pressure on the industry which is already reeling from the existing changes that was introduced. From where I am sitting, it seems that soon, Wadiah will be re-branded into a version of Qard, as a pre-cursor of eventually becoming “pure” Qard. Looks like another one will soon bite the dust. This entry was posted in Hibah, Islamic Banking, Wadiah by Amir Alfatakh. Bookmark the permalink. Will be awaiting your valuable answer on this. 1) allow for payment of discretionary hibah across all customers. Banks are asked to exercise discretion on the payout rate (if any) but discretion is not required for selecting who gets the hibah. 2) historical hibah payout can be published by the bank. The above is reflected in the Qard Concept paper issued on 21 January 2016. As to your question as to how do we pay discretionary hibah if the returns of the Wadiah pool is lower than the payout, the answer is that because it is diacretionary, it is not necessarily tied to performance of portfolio or returns directly. Banks have the right to take returns from other sources (including retained earnings) on their discretion, to make higher payouts of hibah. It is therefore a pure business decision to do so, although it is not very prudent. My name is Amin and I have been one of your blog avid reader/follower if I may say so. I have several questions to ask you if I may. 1. Do you foresee a future where a Qard-based Savings Account cease to exist? 2. If there is a way to package a Qard-based Savings Account such that it will entice potential customers enough to apply for it? How does other countries been promoting their Qard-based Savings Account in the past/present? 3. In the scenario of a bank run, will a lender (customer) in a Qard-based Savings Account be entitled to (both in terms of Shariah and Regulation) all the money that he has lent to the bank in excess of the sum covered by PIDM? Looking forward to read your response and its a pleasure having to read materials coming from you. 1) I believe all products have their shelf life especially when an alternative comes around. Qard Savings Account, in my view, is a contradiction in terms because the purpose of a Savings Account is to retain deposit and grow for purpose of savings. However I think Qard will be around for its basic form. But as a deposit builder, probably a challenge in the long term. 2) The way Qard behaves it is a loan. Other countries with Qard do not do much with it, and it is not the account build deposit. It’s more suitable for transactional current accounts where monies are constantly in use. Reading the Qard guidelines, it does not provide a lot of flexibility to do a lot of enticement activities. 3) Qard is a loan where Bank must meet the payment obligations. There is a difference between Bank run and Bank liquidation where PIDM comes in. In a Bank run, the Bank must be able to ensure liquidity with reserves. Easier said than done. Nonetheless Qard as a loan is a key obligation, before shareholders get their monies back. In liquidity, after PIDM cover, rhe bank still have their obligations under Qard to settle the principal. Its actually the same for a conventional bank when it faced with liquidation. Only when Mudharabah is involved, a different treatment is required from the ringfenced assets.